And she brought forth her firstborn son, and laid him in a manger; because there was no room for them in the inn. And the angel said unto them, fear not, for behold: I bring you good tidings of great joy. And they came with haste, and found Mary, and Joseph, and the babe. 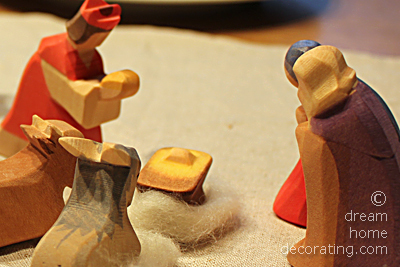 Every year at the beginning of Advent, we create a nativity scene with traditional wooden figures: the magi and their entourage, the shepherds with the angel and the crèche with Mary, Joseph and the new-born baby. This year’s version was set up as a centrepiece on our dining table. 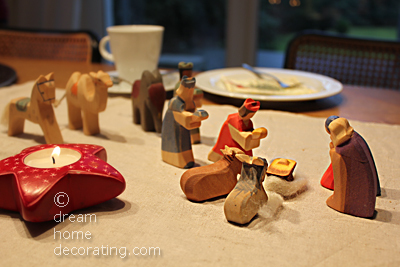 To symbolize the journey from the beginning of Advent to Christmas Eve, we set the Three Kings far away from the manger, at the other end of the table. As they follow the star, each day they come a little closer to the nativity scene until, on Christmas Eve, they have arrived at the stable in Bethlehem. To create the wreath, you simply nail moss patches onto a straw core. It's best to use nails with very small heads. Start with larger pieces of moss (about 10in diameter), and then fill in the gaps with smaller patches. No moss is needed underneath the wreath. Marcia, I don't know where you would get them outside Europe, but there are two workarounds. 1. Use (wide) metal bottlecaps as candle holders: Drive a long flat-headed nail through the center of each bottlecap so that the rim of the bottlecap points 'up' and the sharp end of the nail points 'down'. Glue nailhead & bottlecap together if necessary, and fix the candle into place with a bit of hot wax. Does anyone know where I can get spiked candleholders like these? Jenny, they're Ostheimer figures, handmade in Germany. I'm pretty sure you can get them in the USA! I really like those figures. Can I get them in the USA? 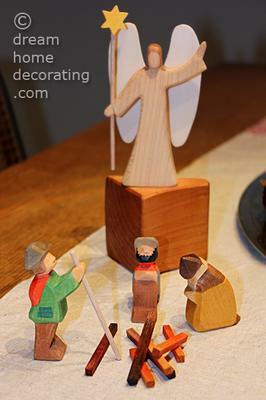 To have a 'moving' Christmas centerpiece that tells a story - wow, that is amazing. 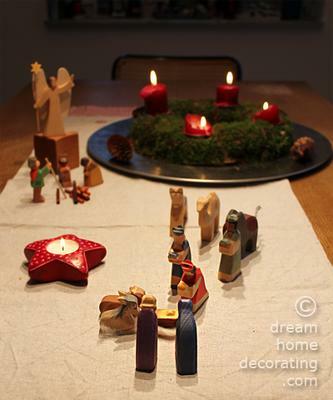 And I like the 'zen' spirit of your Christmas table setting; just the sparse wooden figures with their smooth shapes and simple colors. Readers will also appreciate your wreath making instructions! I imagine you could use a styrofoam wreath shape if you can't get a straw core. The 'wild' moss looks very beautiful indeed. Thank you very much for sharing your lovely ideas, Annette!